This may be the first of a long series of illustrations of this type, 'cause I loved to draw it! 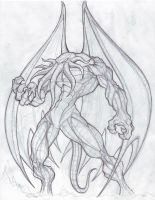 This is perhaps the GREATEST bust drawing of Cthulhu I have EVER seen!!! So cool. Can I use this for my phone's lock screen please?. Nice work Virginia! 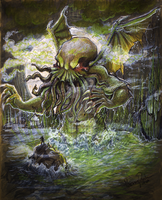 would you like to participate in a Project/Contest about Lovecraft's Mythos? Aloha! We want this to turn into a large network of lovecraftian horror artists so we have decided to extend the project deadline for one more month to February 1st. Please visit our website www.cardifftabletop.com/a-cthu… and sign up. All of the rules and deadlines are listed.